Elliott’s E120 was designed from the ground up to solve transmission construction and maintenance challenges by reducing setup time, eliminating the OSHA test pick requirements, reducing equipment expenditures and optimizing job site performance, according to the manufacturer. Elliott Equipment Company's E120 is an ANSI A92.2 compliant aerial work platform that features 120 ft. (36.5 m) of working height, 80 ft. (24.3 m) of side reach, 600-lb. (272 kg) platform capacity and up to 1,500 lbs. (680 kg) of platform mounted jib winch capacity. 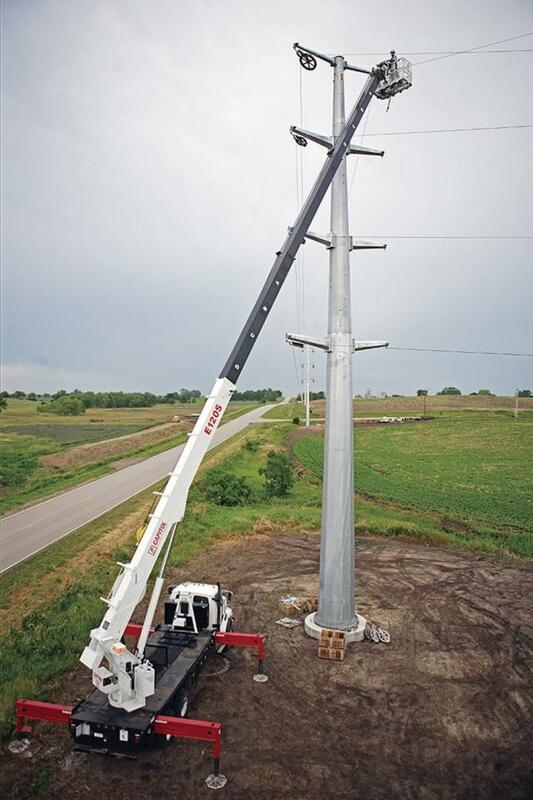 The 105 ft. (32 m), 4-section, cable-extended boom will easily mount of a 3-axle chassis suitable for on and off-road applications. Elliott's E120 was designed from the ground up to solve transmission construction and maintenance challenges by reducing setup time, eliminating the OSHA test pick requirements, reducing equipment expenditures and optimizing job site performance, according to the manufacturer. 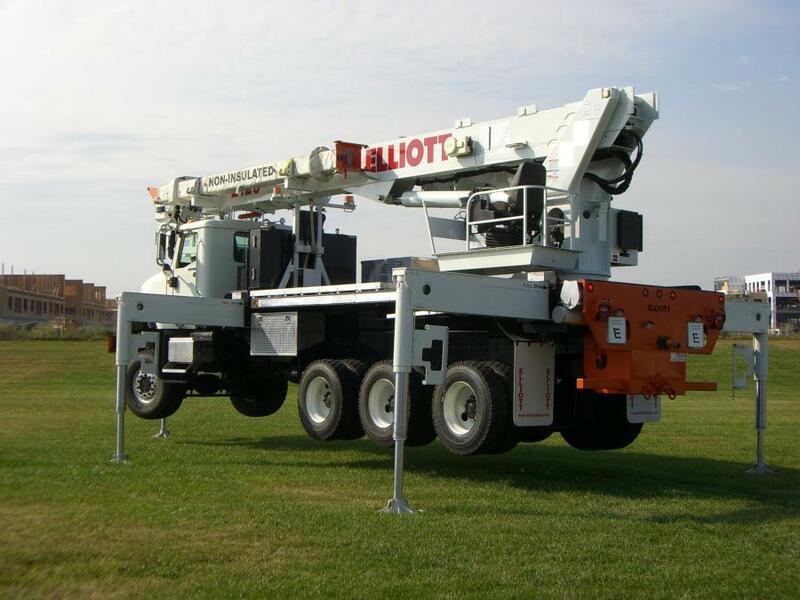 Elliott Equipment Company's E120 is an ANSI A92.2 compliant aerial work platform that features 120 ft. (36.5 m) of working height, 80 ft. (24.3 m) of side reach, 600-lb. (272 kg) platform capacity and up to 1,500 lbs. (680 kg) of platform mounted jib winch capacity. The E120 aerial work platform measuring 34 by 72 in. (86 by 183 cm) with hydraulic leveling, rotation and optional 1,500-lb. capacity jib winch offers the operator versatility while on the job site. The optional platform mounted jib winch extends, elevates and rotates hydraulically eliminating manual lifting. The upper platform control performance is accomplished with individual proportional pressure compensated control valves controlling platform leveling, platform rotation, optional jib winch functions and optional upper tool circuit. The boom functions are controlled with a hand-held radio remote control. The lower control console features Elliott's Ride-Around standing platform, full pressure hydraulic controls mounted on a 360-degree continuous rotation turret for straight ahead line of sight visibility at all boom positions. A full-color LMI display located at the lower control station is standard on all E-Line products manufactured by Elliott. The E120 also fully complies with all applicable OSHA and ANSI A92.2 safety requirements. Jim Glazer, president of Elliott Equipment Company, said that "Elliott products are built to work and built to last. Whether the job involves working deep underground in a mine, installing a sign, or maintaining a transmission line, Elliott aerial work platforms see action every day in the world's most demanding environments."